This is one of those tasty things I came up with randomly, spur-of-the-moment, that turned out really good. I signed on while eating to post about it. - Skewers, tin foil, cooking spray, your stove top or grill and maybe a basting brush. I was just using what I had on hand when I made this, so I ended up tossing crushed walnuts and white chocolate chips onto my ice cream. I'd also suggest shredded coconut and/or caramel sauce. 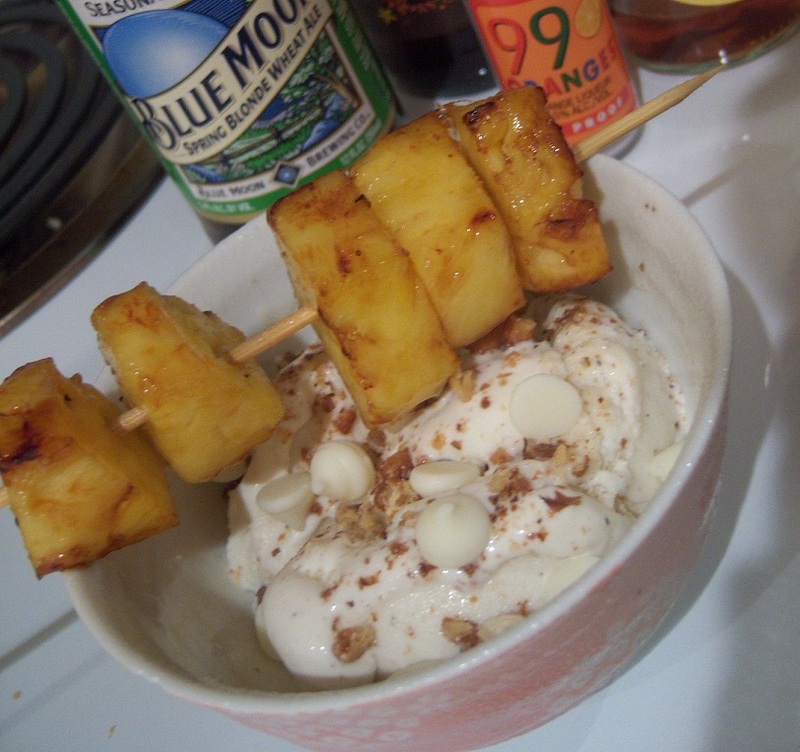 This whole thing could also be done with bananas, to make something quite similar to Bananas Foster. It might be nice to add some melted butter to the sugar/liquor glaze, too, for a richer flavour. While I made these on my poor man's grill (that is, stove top plus tin foil) inside, it would be quite impressive to make outside over a flame, especially if you're using the 99 proof alcohol instead of more traditional rum. It'd be a big hit at your next BBQ, and is healthier and more interesting than store-bought cupcakes or something. First put the dark brown sugar in a bowl and pour the 99 Oranges over it, stirring to combine as well as possible. I used quite a bit of sugar and less alcohol, which you might want to flip around if you are using an open flame and want a show to accompany your dessert. Place one sheet of tin foil over a burner and turn it to the lower end of medium heat. Spritz with baking spray. If you are doing this on the stove top, keep in mind that this does throw off a bit of white smoke, so I kept a fan handy. Skewer several bite-sized pineapple pieces, coat them well and toss them on. When they're most of the way through cooking, brush some more of the mixture onto them. Then get your ice cream and toppings - chocolate sauce, coconut, etc. - and push the fruit off the skewer on top of it. Serve immediately. Most of the alcohol in the 99 Oranges cooks off and leaves a rich orangey flavour behind. It's pretty great.